We provide cycle bays free of charge for students wishing to cycle to college. These bays are monitored by CCTV but bicycles are left at the student’s own risk and must be secured at all times. The cycle bays can be accessed with your student ID card. Requests for student ID cards to be updated to allow cycle locker access must be sent to [email protected]. There are bays on the college site available free of charge. If you do not live on one of the college bus routes and are thinking about driving to college you should be aware that there is no on-site parking for students and there are parking restrictions in operation on roads adjacent to the college campus. Students are expected to park in accordance with the relevant parking regulations and be considerate of our neighbours. 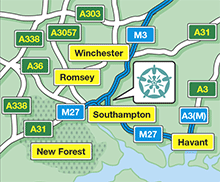 Barton Peveril is served by good rail links via Southampton Airport Parkway and Eastleigh railway stations, both of which are a 20 minute walk away. Students are responsible for making their own arrangements for train travel.